A typical sewer backflow preventer valve. Basement valve problems? 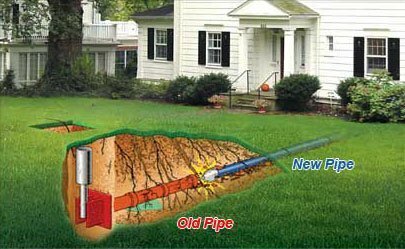 Call us any time at A1 Sewer & Drain Services for basement sump pump and sewer system repairs in NJ, at 201-645-0888. 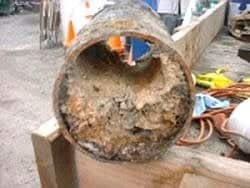 Sewer System and Plumbing Basement Valve Inspection by NJ Plumber For Homes in Bergen County NJ. What I want to tell you about today is this full- flow sewer back-flow valve. 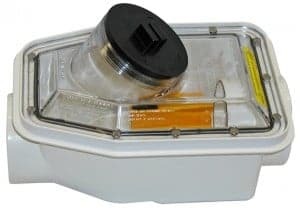 These are devices designed to protect the home in the event that the municipal sewer system can’t handle all the flow, or is plugged or whatever and the system starts to back up and sewer junk just wants to back up into your house. So these valves are one-way flow vales, and hopefully you will never need them, but if you do you want to make sure that they’re working. Backflow valve installation is one of the best ways to prevent flooding and serious water damage in your home. Unfortunately, the backflow valves that are used in 99.9% of the houses generally only work if they are kept clean. And this is the catch. It’s that of course most people don’t clean them regularly and in probably 99.9% of the cases most people don’t even know where they are in the house. Finding them can be a problem. Sometimes they are in a finished basement under a carpet or stuff and it’s very tricky to find out where they are. 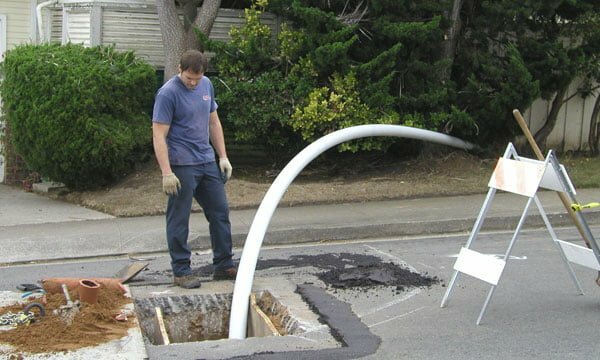 At A1 Sewer & Drain, our local NJ plumbers provide sewer backflow preventer valve inspection, sewer repairs, and more in Bergen County and nearby areas of north New Jersey. Call us any time to find out more. Usually it is actually a sewer backflow valve. Often, when we check for it, we can see by the lid that it’s never been opened, it’s got concrete around the perimeter. So we have to break the cover free from the concrete. There is usually also other opening or device, which is actually the sub chamber, which I also have to open up and check. So to break the cover of the sewer backflow valve free i’ll use a hammer and an old screw-driver to break the cover of the sewer backflow valve free. So I get the edges of the sewer backflow valve free. The sewer covers are very tough, but now they have these little new ones that are just a plastic cap with a fixture on the end, so you don’t have to worry too much, you just pop the cover right off. The ones that were done prior to 2010 have an actual bolt, so you have to put a wrench and remove the bolt. Eventually, when I get enough concrete off from around the perimeter of the valve cover it should pop free. Then you can should see the sewer valve freely. 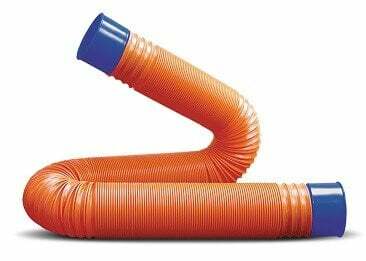 Start running all the tubs and baths and stuff like that now, to ensure there’s no leakage in the draining system of the house. Then wait to hear the sound of the water running through the valve. Now in most homes, once you pull the cover off it won’t be quite pretty. You’re going to find this (hole) to be filled with sand or gravel and you might actually need to get in with a small shovel and gently dig down to expose the valve. 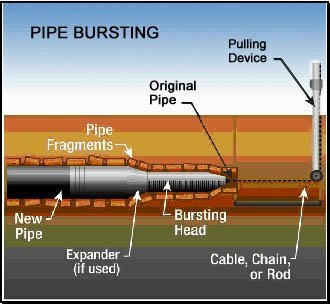 A good plumber will use a deep retainer on both sides of the valve, and for that reason you should have no cavitation of the sand or grovel over the valve, no flow-in of the concrete because sometimes the concrete flows as they are pouring it over and there is covering of concrete over the top of the valve. The top is a screw cap and you just need a little tool like maybe a pair of pliers to get a hold of that and break it free. As you remove the cap be careful because there is an o-Ring right there, and that’s going to keep everything in here nice and watertight. Inside there probably is sewage and water , and on the bottom there should be a yellow flap. That yellow flap is actually the flap that closes if your sewer system backs up. Now, if you look on each side, you’ll see a small black rectangular float. And that float is what starts the initial floating process, so if the fluid levels are on the downstream side of the valve and it starts to fill up the system because of a back-flow situation, those little floats start lifting the yellow flap. So, the flap starts the lifting process of course with the lifting of these two tiny floats. And the initial lift is very, very weak, then the pressure of the returning sewage which is in the opposite flow of the water right now, slams this flap shut. And what happens over time is that underneath this flap, over time bacteria and sewage scum, or sometimes fats that people pour down the drain collects underneath and all around this flap. And when they do, this flap can’t start that initial lifting. And then there’s nothing stopping the sewage from pulling straight up into your house. And the first place that’s going to show up is probably into your drain, and it could come into basement bathroom. 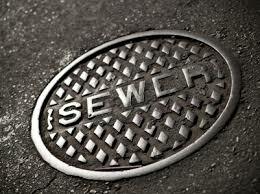 And of course, there’s nothing worse than a sewer back-up in your house! So, what you should do, is once a year open your valve, get on some gloves, get a brush, probably a long-handed one and get in there and scrub it clean. Underneath, on top, all the sides, just make sure it’s nice and clean. And if it’s clean, it will be good to go and it will protect your house. 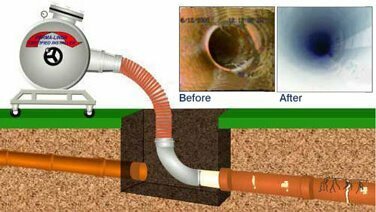 Call us any time for fast, reliable sewer and drain services from experienced NJ plumbers, at 201-645-0888.